Are You Starting Your Very Own Collection of Analytics Sites? Google Analytics, Site Catalyst, CRM, Facebook, LinkedIn, Hootsuite and more…is your method of tracking your video marketing statistics becoming cluttered and difficult to manage? Without a doubt, business analytics are key to understanding your needs and the needs of your customers. However, it doesn’t mean that you have to get yourself lost in a tangle of multiple analytics platforms. With VidCorp, you can put all your tools safely in one place. No more need for multiple logins and endless reports. 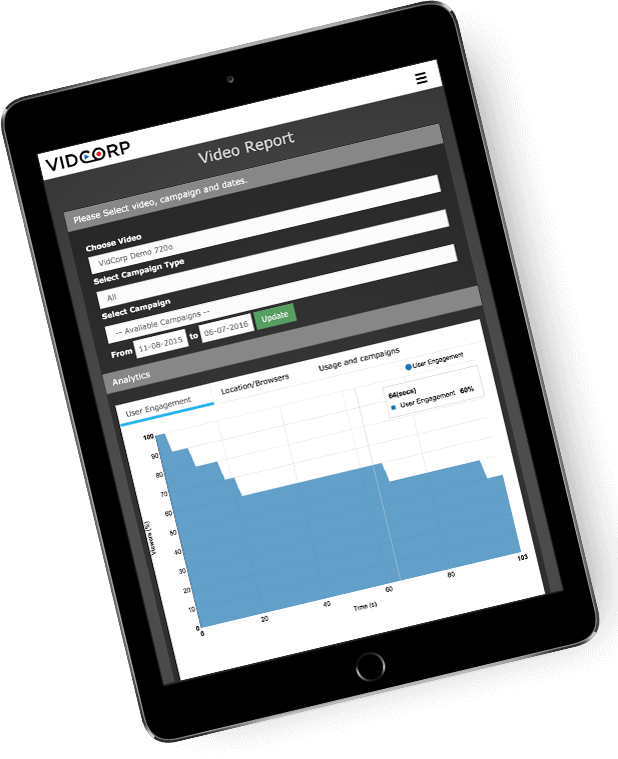 Having all of your key video, bulk SMS, email, delivery status data, stored safely in one place with VidCorp will streamline your video reporting. With easy access to these video analytics, you will easily be able to measure the success of every campaign. Track analytics on an individual and aggregate level. Get up-to-the-minute video marketing statistics that will tell you who is watching the video, where, when and on what type of device. Get detailed video insights including who has completed surveys, clicked any call to actions or those who required further information from the uploaded documents. Having this information at your fingertips allows you to directly respond to consumer needs. VidCorp’s all in one service also has API and CRM integrations with Google analytics, leading CRMs, LMS’, marketing automation platforms, and payroll systems. Easily calculate averages on delivery and click-through rates through campaign video analytics. The platform provides constant updates regarding each separately labeled campaign. Easy access to a multiplicity of video reporting, including campaign statistics, contact reports, form reports and more detailed reports. Label and safely store all data and video marketing statistics. We offer complete data security with our cloud storage. View breakdowns of target market acquisition, engagement, location and devices. Stop making your video analytics unnecessarily confusing, all you need is one platform for video reporting! Optimise your campaigns with VidCorp’s Video Analytics and Insights Dashboards.